The three lines of defense model seems intuitive on paper. But, a successful implementation of the model requires common definitions and processes, clear delineation of roles and responsibilities and efficient collaboration and information sharing across all three lines – the business, compliance and risk management and internal audit. But how do you implement and drive business engagement in risk management processes without creating silos with layers of duplication, while maintaining the appropriate coverage of key risk areas, staying responsive to regulators and providing flexibility to change? Technology can help. Join this session for greater insight and learn more about how to integrate technology into your dynamic three lines of defense for a more successful and sustainable risk management program. The post Leveraging Technology to Demystify the 3 Lines of Defense appeared first on OCEG. 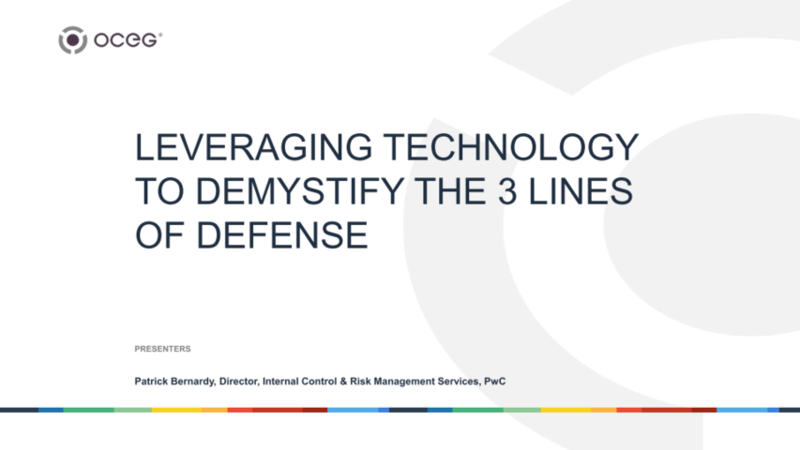 We have emailed instructions to access Leveraging Technology to Demystify the 3 Lines of Defense Slide Deck to . Make sure the email arrives in your inbox: either add "support@oceg.org" as a safe sender to your email platform, or if you use Gmail, drag our email into your Primary tab.